The Rugby Chamber of Commerce, Inc. dba/Greater Rugby Area Chamber of Commerce, is organized for the purpose of advancing the economic, industrial, agricultural, professional, cultural, social and civic welfare of the Rugby Area, including the promoting of economic programs designed to strengthen and expand the income potential of all classifications of business within the trade area; promoting programs of a civic, social and cultural nature which are designed to increase the functional and aesthetic values of the community and discovering and correcting abuses which prevent the promotion of business expansion and community growth. 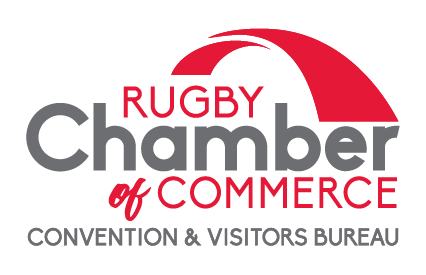 The mission of the Rugby Convention and Visitors Bureau is to market Rugby and the Greater Rugby Area as an enchanting destination to the world, to enrich the quality of life and improve the economy of the area by generating tourism and travel through social and cultural attractions and enhancing the image of the state. 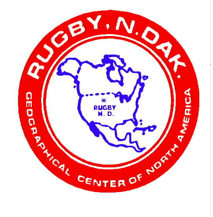 Increase visitor numbers, length of stay and visitor expenditure by positioning Rugby as a distinct and competitive tourist destination along with the surrounding area and the state of North Dakota. Take a proactive role in the tourism industry, encourage professional standards and the development of cooperative arrangements which maximize industry effectiveness. The center is marked with a monument or cairn that is pyramid form in shape. It is 21 feet high, 6 feet wide at its base, and set on a heart shaped foundation. It was built across the highway, northwest of its present location, by W.B. Paterson and E.B. Paterson with the assistance from local Boy Scouts and other young men in the community. The Rugby Lions Club donated Cement and other materials used in the construction. It was completed in August 1932. It remained at that location until July 1971 when Highway 2 was changed to four-lane and its location was becoming a frontage road. At that time it moved to its present location on the southeast corner of the intersection of Highways 2 and 3. In 1995, work was done to beautify the area around the monument with a rock garden welcoming you, an information board, and three new flagpoles to represent the United States, Canada and Mexico (the countries making up North America). Town site was platted as Rugby Junction in July 1886. First building was under the firm of Jacobson and Anderson. Post Office was established on December6, 1886. Nels Jacobson was the first postmaster. Railroad began passenger service on August 1, 1886 with Rugby being their dinner stop. Passengers still depart and board Amtrak from the community-restored depot. Pierce County was established in 1887 by the territorial legislature and named after Gilbert Ashville Pierce, governor of the Dakota Territory and later one of North Dakota’s first United States Senators. Rugby Junction became a village in May 1987 and a city on July 13, 1905. Pierce County Courthouse built in 1910 and has been named to the national Registry of Historic Places. Favorite attraction of this structure is the hand painted scenes of North Dakota in the building’s dome.